The Eastern Hercules has a wing span up to half a foot, the armor of a knight, and the spots of a leopard. I guess I should be honored that the front desk volunteer thought of me first. One day a little over a week ago, I got a call saying a woman was at the front desk with something she thought the Garden might want. 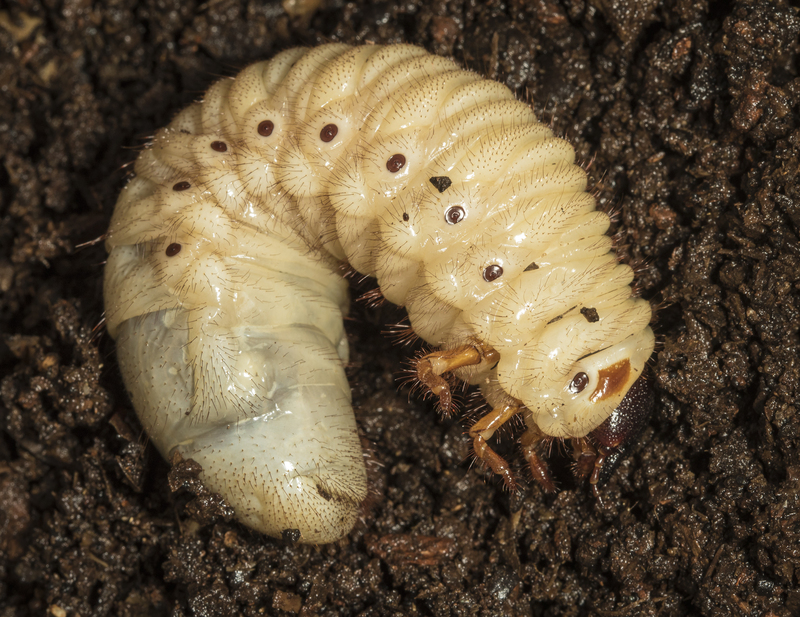 She had a tree company take down a large tree in her front yard and the workers had discovered some Eastern Hercules beetle (Dynastes tityus) grubs in the rotten core of the tree. They had taken most of the grubs but she later discovered some still living in the rotten stump. So, she brought them to the place she knew cares for all things natural, and asked if anyone might want to keep them. Somehow, my name came up….go figure. When I went downstairs, the lady pulled out a flower pot filled with rotting wood from the stump and shook it around to reveal two huge grubs. They resemble the large grubs you frequently find under logs, only much larger! 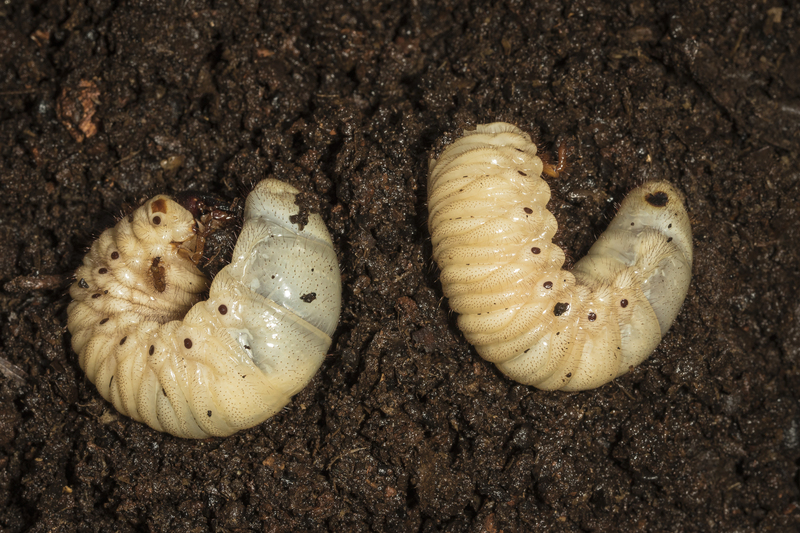 These grubs are as thick as my thumb and as long as my index finger. They resemble the large, curled beetle larvae I often find under logs, but these are much larger. 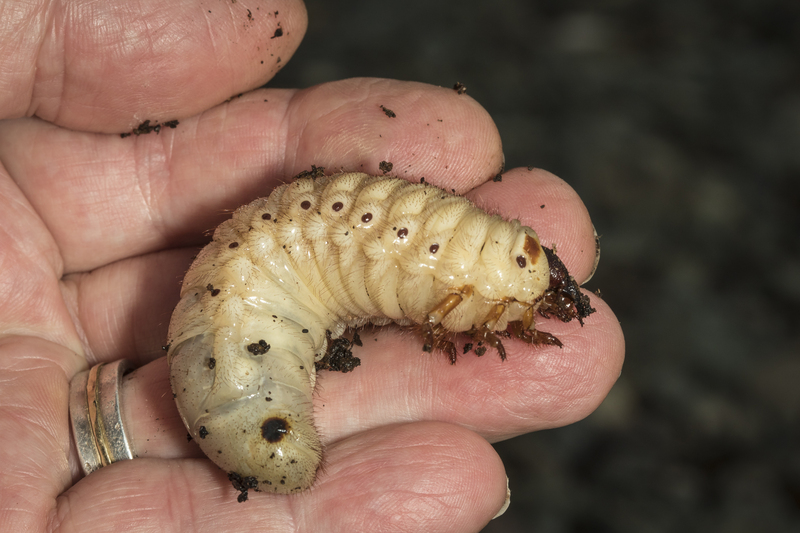 The only other grubs I have seen that were this large were in the Amazon. Years ago, on a museum educator workshop, we were walking in the jungle along the river. One of our participants was a teacher from a local village. The group stopped next to a fallen tree to look at some birds in the canopy above. I noticed the local teacher leaning over the fallen tree trunk, listening. He then became very excited, ran back to his village and returned with a machete. He began to chop into the log, pausing, and listening, then chopping some more. He soon exposed a group of huge beetle grubs. He had heard them chewing inside the log and wanted to get them out as they are a prized food in that region. After explaining what they were, he proudly presented one grub to the three group leaders for us to take the first bites. Being the youngest of the three, I managed to get the back end of the larva. I can’t say I really recommend them raw (or maybe it was just the choice of my cut). On his recommendation, we took the remaining grubs back to the lodge as a side dish for dinner that night. The roasted grubs were much more palatable, with a somewhat nutty flavor. But not to worry, I have no intention of chowing down on these grubs. My interest is purely scientific. After bringing these not-so-wee-beasties home, I started searching the web for information on how to keep them. 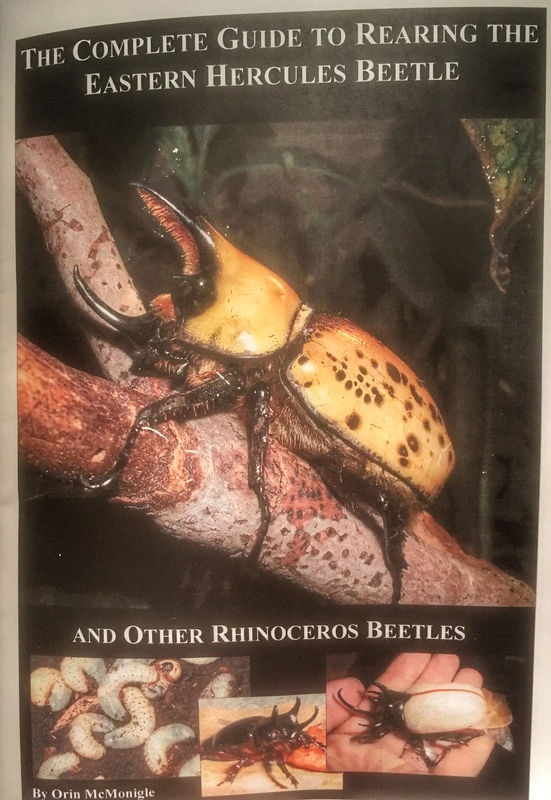 As is often the case these days when I search for what seems like an obscure topic, I found a wealth of information, including a link to purchase a guide to rearing Eastern Hercules beetles. Well, naturally, I had to have it. The booklet arrived a few days later and has everything you need to know about breeding and raising these beautiful insects. Apparently, it has become a thing to raise these behemoths (or their close relatives) as pets, especially in Japan, where they are sold in many pet stores. I learned I may have my pets for awhile, as they remain larvae for 12-18 months! Based on the information in the book, I now have them in a large flower pot with some potting soil and rotten wood. The grubs feed on the decomposing wood and associated microbiota. The substrate needs to stay moist (not wet) and I will need to replenish the rotten wood from time to time and maybe enrich the substrate with some rotting fruit or dry dog food on occasion. After pupating, the adult beetles will emerge and can live for 6-12 months. I have seen the adult beetles come to lights and have found a few dead ones over the years, but had never seen the grubs until now. The adult males are among the largest and heaviest beetles in the United States. The horns are harmless to humans and are used for battling between rival male beetles. 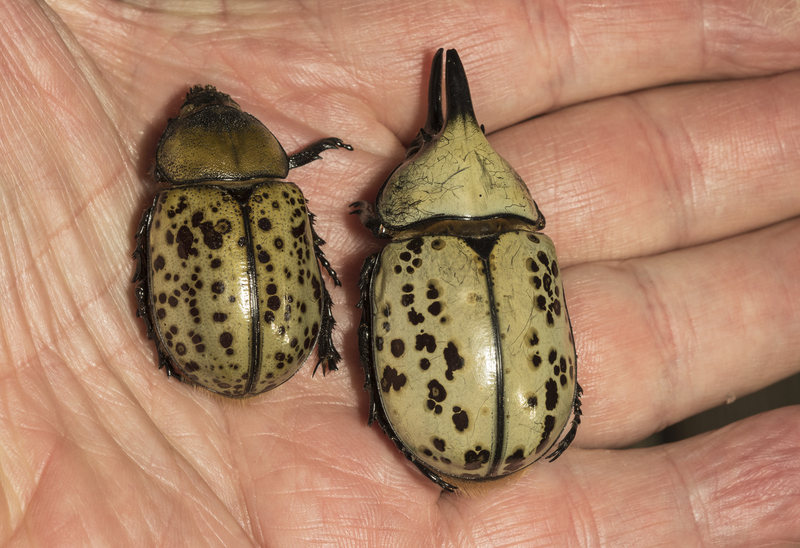 The spot pattern is distinctive for individual beetles. Adult beetles feed on rotting fruit and tree sap. The large horn on top has a lining of stiff “hairs” underneath. I tried to find a purpose for this distinctive trait, but, as yet, have not found any information on it. If anyone reading this knows, please drop me a note. 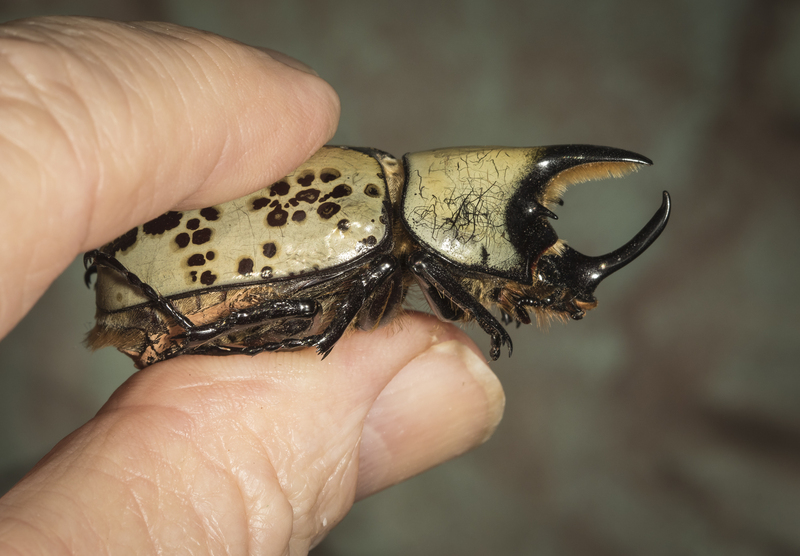 This entry was posted in Natural History and tagged Eastern Hercules beetle by roadsendnaturalist. Bookmark the permalink. You never cease to amaze me. Looks like Mary anne left you a present. Just like her! Is there anything more exciting than one of these monster beetles? Love it! Good luck parenting these grubs! Can’t wait to see the results. YIB! Found a dead male in my back path some time ago. I wondered then about the yellowish color but just figured it was in Sarah’s domain so it had to be yellow😏 Pulled down a dead red maple & left it on the ground – a bit later I moved it and found a huge white grub but didn’t pursue it. Had to be one cause it was bigger than my thumb. When you were eating the one in the Amazon, did you wonder what all that dark stuff at it’s rear end was? Unfortunately, Tom, I suspected the dark stuff was just what it was😳 but I couldn’t disappoint our host. Hey Miguel! So nice to hear from you. I must admit, when cooked, they were pretty tasty. Miguel, I also wanted to say that was a wonderful tribute you posted to Mary Ann. She made a huge impact on so many. If you are ever up this way, please get in touch. Would love to see you. They really are like something from bad Japanese science fiction movies!